a kind of competitive patience ( solitaire card ) game for two players, you can play Spite and Malice double solitaire card game with your friends and PC ! 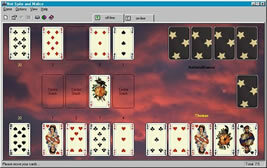 Net Spite and Malice is a kind of competitive patience (solitaire card) game for two players you can play against the built-in computer opponent or/and against a human opponent through the Internet or a LAN. It is also known as Cat and Mouse (SkipBo is a commercial version). Both players try to be the first to get rid of a pile of "pay-off cards" by playing them to centre stacks which are begun with an ace and continue in upward sequence to a king. This is not a physical race - in Spite and Malice the players take turns. Lets you play Spite and Malice against computer or/and live opponents on two game tables that easy to change . My Solitaire Game - It is World's Top 100 Most Played Solitaire Card Games Collection.